The challenge of “lone offender” terrorism is a serious one for law enforcement and security services around the world. Though the tactic has been used for hundreds of years, the rising number—in some countries—and diversity of “lone” attacks are increasingly troublesome. Attempts to clearly define the phenomenon, however, have been rather elusive. 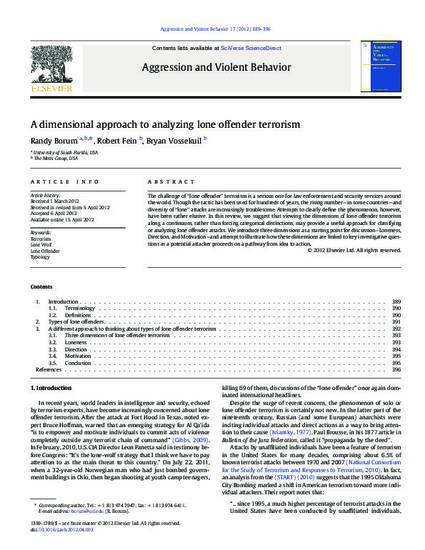 In this review, we suggest that viewing the dimensions of lone offender terrorism along a continuum, rather than forcing categorical distinctions, may provide a useful approach for classifying or analyzing lone offender attacks. We introduce three dimensions as a starting point for discussion—Loneness, Direction, and Motivation—and attempt to illustrate how these dimensions are linked to key investigative questions as a potential attacker proceeds on a pathway from idea to action.